This Slow Cooker Buffalo Chicken Dip Recipe is so easy to throw together for a gathering of friends! When using a slow cooker for entertaining, well, it makes it easy to get food ready without spending a ton of time in the kitchen. I tweaked this recipe from a FRANK’S® Buffalo Chicken recipe to fit in with slow cooking. We love it! This recipe is a variation of FRANK'S® Buffalo Chicken Dip. I prefer to use the slow cooker and non-canned chicken. Layer in all the ingredients in a mini slow cooker EXCEPT for the Cream Cheese. Cook on low for 3-4 hours or until Chicken is cooked through. Throw in Cream Cheese and let cook thirty minutes more. Serve with Crackers, Celery, Pretzels, or Dipper or your choice. 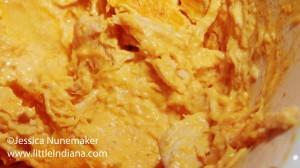 Schema/Recipe SEO Data Markup by ZipList Recipe Plugin2.2http://littleindiana.com/2013/11/slow-cooker-buffalo-chicken-dip-recipe/Photos are the Property of little Indiana. Do Not Use Without Permission.